The family and friends of Thomas Burnett called him an American hero during funeral and burial services Friday in the Twin Cities. Burnett, a Minnesota native, was one of several men who resisted the hijackers who had taken over Flight 93 and caused the jet to crash short of the terrorists target on Sept. 11. Government officials believe the passenger jet, which carried Burnett and 44 others, was heading for the White House. Before the service, about 50 people gathered in front of the church to dedicate a small white oak tree to Burnett's memory. At the base of the tree is a large rock inscribed with words paraphrased from the biblical Book of John, "There is no greater love than to lay down one's life for one's friends." About 75 friends and family members gathered at St. Edwards Church in Bloomington, the city where Burnett grew up and went to high school. Burnett graduated from Jefferson High School and quarterbacked the school's football team. Before the funeral, members of the group congregated on the lawn just outside the church where an oak tree was planted in his honor. Burnett was 38 and a resident of San Ramon, Calif. He was on his way home when terrorists took control of Flight 93. Burnett is credited for leading other passengers against the hijackers. Monsignor Joe Slepicka told Burnett's mourners that God had a plan for Burnett on Sept. 11. "Many times, yes, many times God calls the most unlikely people to do special things. For you see God's call sometimes, leads to great suffering and even death," he said. Burnett was buried at Ft. Snelling National Cemetary. Burnett's widow, Deena, was presented with the flag from her late husband's casket by a uniformed veteran. With tears in her eyes, Deena Burnett held the flag tightly and accepted a salute from the officer. The family opened the service to the public. About 50 people came to pay their respects. St. Paul resident Jeff Lyman says he came to Ft. Snelling to honor Burnett as an American hero. "Tom Burnett sort of exemplifies the kind of human being that puts forth the ultimate sacrifice for that freedom - for all human kind," he said. Burnett served three months military service and was eligible for burial there. Burnett's father, Tom Sr., says there's another reason why he thinks his son deserves to be buried in the same cemetary with thousands of men and women who died in the nation's war. Burnett's widow, Deena, was presented with the flag from her late husband's casket by a uniformed veteran. With tears in her eyes, Deena Burnett held the flag tightly and accepted a salute from the officer. "He and all of those guys that... went against those hijackers, they were in the vanguard on the new war on terrorism. They were civilian soldiers," he said. Burnett Sr. says life has been difficult for the family since Tom Burnett's death. However he says they've been comforted by the outpouring of support for the family. The Burnetts and other families of the victims of the crash were allowed to listen to cockpit voice recordings of the last minutes of Flight 93. Tom Burnett Sr.'s face widened with a proud smile as he recalls hearing the hijackers react to the four men who stood up to them. "And when we heard those tapes, we heard those lousy hijackers screaming and exclaiming, and it was a great comfort for us to hear that stuff," he said. 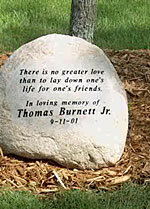 Thomas Burnett would have turned 39 on May 29.